A woman dubbed a menace for bombarding the emergency services with nuisance calls has appeared at court. Jane Smith repeatedly phoned Lancashire Police and the North West Ambulance Service even though she was banned by a court from contacting either service except in a genuine emergency. Among the ludicrous calls Smith made to police was to tell them that they should contact her partner and tell him not to drive because of the weather and that she could not work her television. She had previously phoned police to ask them to move her mattress because she was tired. Smith, 54, of Withnell Road, South Shore, pleaded guilty to two offences of breaching a Criminal Behaviour Order (CBO) by phoning the police and ambulance service. She was sentenced to a 12 month community order with up to 30 days rehabilitation to be supervised by the probation service, fined £50 and ordered to pay £85 victims’ surcharge. Prosecutor, Jim Mowbray, said Smith broke the CBO by making a series of calls to the police and ambulance service on February 27 and 28 and March 2. During the calls she shouted and swore at call operators and accused police of terrorising her. On March 2, police went to Smith’s home after she asked for an ambulance at her home. Paramedics told police officers she did not need medical assistance. Police described Smith as intoxicated and arrested her. Ryan Broxup broke into the staff room at Nando’s restaurant and stole two purses. Broxup, 43, of Cheltenham Road, North Shore, pleaded guilty to burglary, two frauds and two attempted frauds. He was jailed for 29 weeks and ordered to pay £115 victims’ surcharge.Prosecutor, Pam Smith, said workers at Nando’s, Church Street, discovered the staff room had been burgled on May 7 at 3.20pm. Two purses containing bank cards, a driving licence, make-up and £190 in cash were taken. CCTV showed Broxup breaking in. One of the bank cards was then used at the Shell garage, Talbot Road. Shortly after, Broxup was recognised by a taxi driver who had seen him at the garage and he was put under citizens arrest. Broxup told police he had spent the cash he stole and given some of it to others. He gave one of the bank cards to another man who did not know they were stolen. His criminal record had previous burglary and fraud offences on it. Howard Green, defending, said his client had a problem with drugs and drink which he was desperate for help with. A teenager accused of trying to attack family members with two knives and assaulting his mother has made his first appearance in court and fainted in the dock when he was refused bail. Cameron MacWhirter, 18, formerly of Bloomfield Road, South Shore, now of no fixed address, is charged with affray and possessing two knives at the family home. He is also accused of damaging items in his mother’s bedroom and causing £2,000 of damage to the windows of a cousin’s car and home. The offences are alleged to have taken place on May 27 and 28. Prosecutor, Jim Mowbray, asked for the case to be heard at crown court and opposed bail. Defence lawyer, Howard Green, said his client would not indicate pleas to the offences at that stage. MacWhirter was refused bail and remanded in custody to appear at Preston Crown Court on June 27. 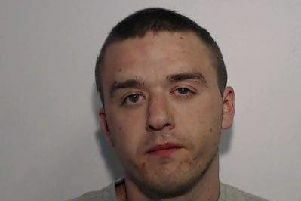 A 21-year-old Blackpool man had a further 14 hours unpaid work added to his sentence. Jordan Whatmough, of Marlhill Road, Grange Park admitted breaching his community order by twice failing to turn up for unpaid work. Whatmough admitted the offence and the court heard how he had accomplished 64 hours of the 200 he had been sentenced to. Whatmough said he had felt ill and been unable to leave his room.